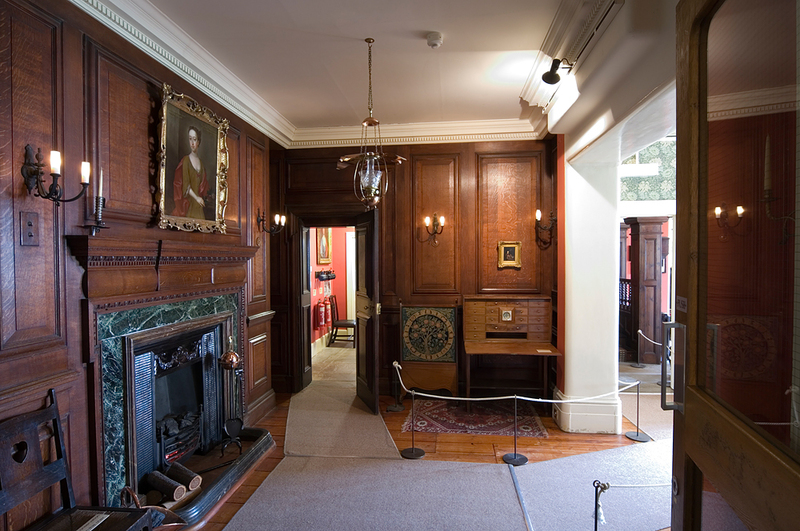 Walking through the Victorian Mansion (as it was), you would have been forgiven for thinking that the oak panels in the smoking room were an original feature of the house. In fact they were designed by the architect Norman Shaw for the Partners' Dining Room at 8 Bishopsgate Road, London, the headquarters of Baring Bank & Co Ltd. Before its collapse in the '90s (after employee Nick Leeson lost $1.3 billion dollars in speculative investments), Barings was one of London’s oldest financial institutions and had been trading since 1762, moving into Bishopsgate in 1806 and remaining there until the bank's collapse in 1995. Originally, the building had been a Georgian style house but over the years it underwent several expansions and refurbishments, including in the 1880s work by Norman Shaw who was employed to redesign the frontage and some of the rooms inside, all in his typical Queen Ann style. Unfortunately the building was demolished in the 1980s to make way for a wider road and was replaced by a skyscraper. Before the wrecking ball struck the bank donated parts of the building to museums across the country. The Ground Floor waiting room went to the Bowes Museum in County Durham, the Board Room and Ante Room went to Southampton City Art Gallery (where it provides a back drop for Edward Burne-Jones’ ‘Perseus Cycle’), parts of the Banking Hall went to the Museum of London, where it is displayed as a room setting in the Victorian Walk, while the Partners' Dining Room came to Cecil Higgins Art Gallery. 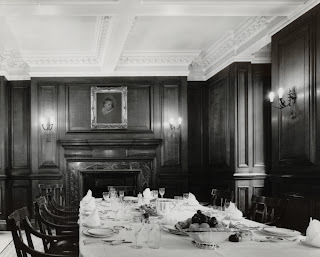 The panelling was installed in the Higgins house in the mid '70s, and although the room was a different shape to the original Dining Room, much was done to avoid altering it to fit. Now, thirty years later, the panelling has come down, and as carefully as it was put up we have been equally careful taking it down, hiring professional furniture conservators who catalogued each piece, so that when the builders have finished we can reinstall the room and know exactly which piece goes where (much like a jigsaw but with very, very heavy pieces). Thankfully a lot of the panelling is in large sections (those lifting the sections were obviously not quite as thankful! ), apart from the fireplace which seems to be the most complex part with several large sections of marble, iron and wood making up what looks at first viewing like one piece. The good news is that the panelling is in really good condition, considering its various past lives. All it will need before it is put back is a clean and a polish, leaving it with a secure investment for its future. Seems strange to think of the Baring Room without its wood panelling. I wonder if the ghosts have also gone into storage with it.